The precious metals have a very serious problem, one of the reasons that they are called precious metal is because they are scarce. Therefore, in order to make up for the shortcomings of rare and precious metals, some materials which are developed by special technology and new technology are used to make jewelry. Metal jewelries which are specially formulated from these materials are: rare-earth gold jewelry, aurous jewelry, argentous jewelry, light alloy jewelry. This jewelry is made by adding rare earth element into brass, the color is close to 18-20K gold and it won't fade, its resistance to corrosion is good and it will become brighter after rubbing, This material is mainly made of imitation of gold jewelry. It is a copper-based new imitation gold material. 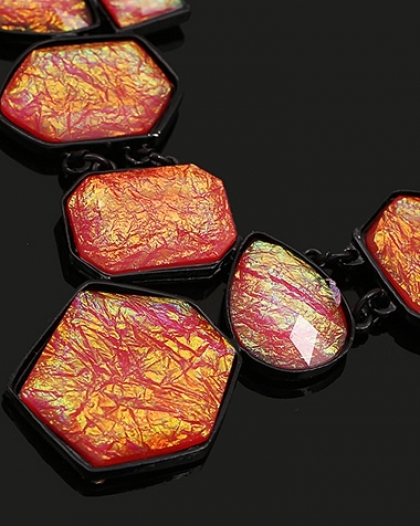 , The appearance of jewelry made by aurous gold is similar to K gold, and so is the texture, the main advantage of this kind of jewelry is its corrosion resistance of air pollution and human sweat is better than brass and silver, but still slightly lower than gold. Argentous jewelry also known as nickel silver and German silver, which is composed of 60% copper, 20% nickel and 20% zinc. This material is ductile with slightly yellow-gray color, the texture is suitable to inlay various jewelry. And when producing, the surface will be coated with silver or rhodium (which is also called imitation platinum) to approximate close the appearance of silver. In recent years, gemstone market often use a variety of new aluminum ally materials to make lightweight metal jewelry. Such jewelry is not only gorgeous but also fashionable. In addition to aluminum alloy, outer overseas also began using hot-resistant metal - titanium and molybdenum alloys to make jewelery. The surface of such jewelries will product colorful shiny clolors after hitting or or electric hinge.The most typical is now the popular statement jewelry and fashion costume jewelry.